PUPPY LOVE is the perfect choice for your Smoky Mountain Honeymoon or romantic retreat! 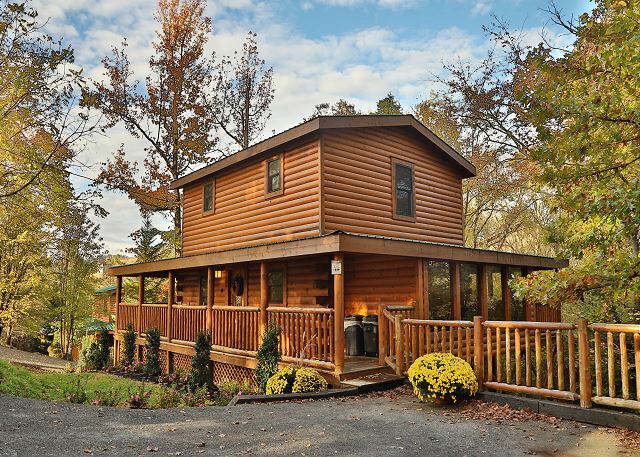 This beautiful log cabin is located in the heart of the Great... VIEW NOW. Location: Pigeon Forge, TN Between Light #8 & Light #10 (just a short walk to the Parkway, Little Pigeon Forge, & Dixie Stampede.) This beautiful private, heated pool cabin is just 1 mile from the Pigeon Forge Parkway. No mountain roads, no access to the Parkway with city water utilities, wifi internet, and great amenities! All NEW SmartTVs aka premium flat screens installed since photos taken! Enjoy your favorite movies or sports on Big Screen TVs now! Dollywood, Dolly's Stampede, and Splash Country are all less than 2 miles from Skinny Dippin! This true log cabin just got all NEW living room furniture including premium sleeper sofa. You'll love the amenities, game room, high speed wifi internet, comfortable beds, location, and relaxing surroundings of Skinny Dippin! This amazing Smoky Mountain log cabin offers a splash adventure with your own private heated INDOOR Swimming Pool and relaxing hot tub! Let the fun begin for all couples and families that want to visit Dollywood, The Island, Leconte Convention Center, or Cal Ripken Baseball Experience all within 1 mile of this gorgeous log cabin! 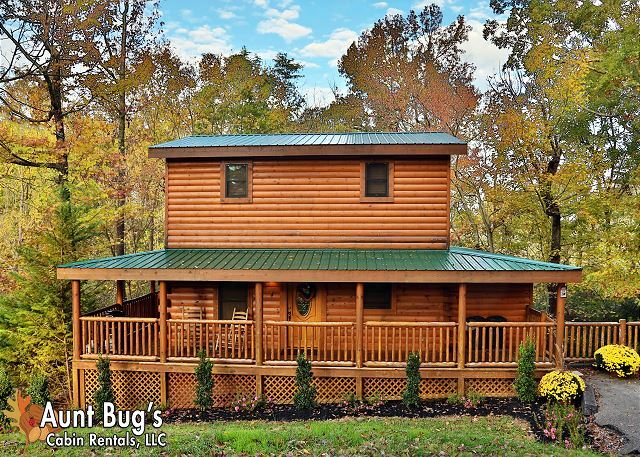 Your family and friends will have a blast at this 5 star log cabin! 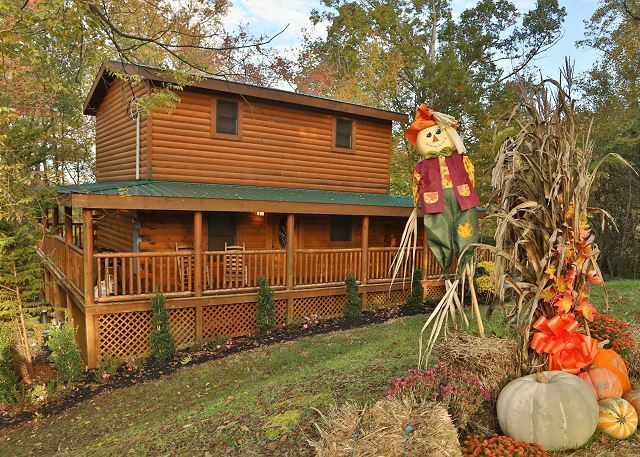 This log home is featured just a short walk from the Little Pigeon River & about 1 mile from the Parkway. You can walk to the Parkway or the Trolley Stop, which is perfect for those busier days or car shows here in Pigeon Forge. 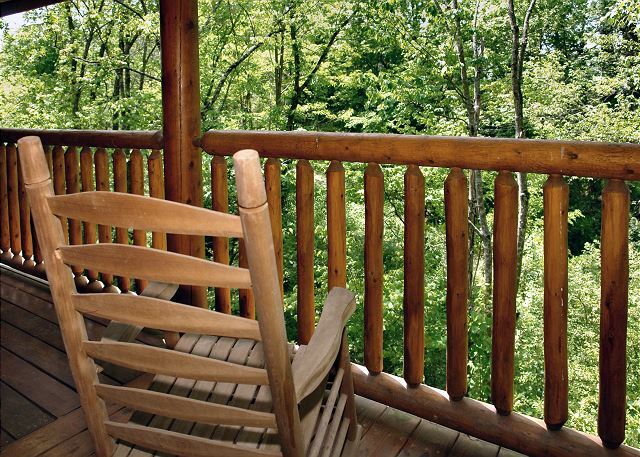 This vacation cabin is fantastic for friends, young families, or romantic getaways. Make a Splash in the Smokies. Reserve Skinny Dippin' cabin while availability lasts! 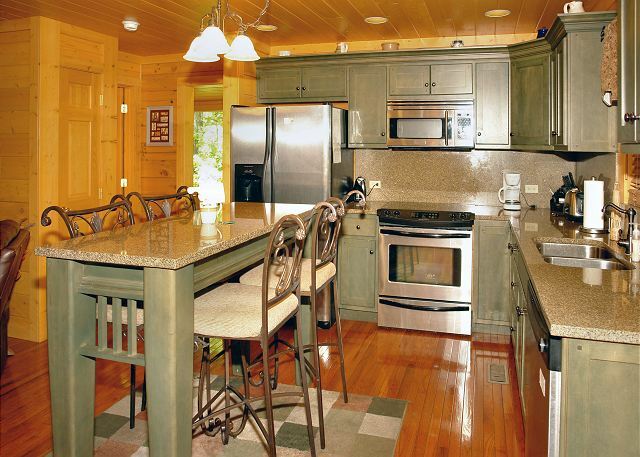 As you enter this Tennessee log cabin, you will be very impressed with the custom-built kitchen. It features stainless steel appliances & granite counter tops. You'll have a high top table to enjoy your meals. Cook-out on your own gas grill on your deck. Your living room has leather furniture & a gas fireplace (seasonal). On the east side of the main level, you enter the sunroom which features a TV, foosball table, air hockey for your entertainment. Upstairs you will find two king bedroom suites with their own bathroom & television. Downstairs you will find the professionally maintained (CPO certified swimming pool techs clean your pool prior to each visit), heated indoor swimming pool. Outside the indoor swimming pool room, you'll have access to your own private hot tub. 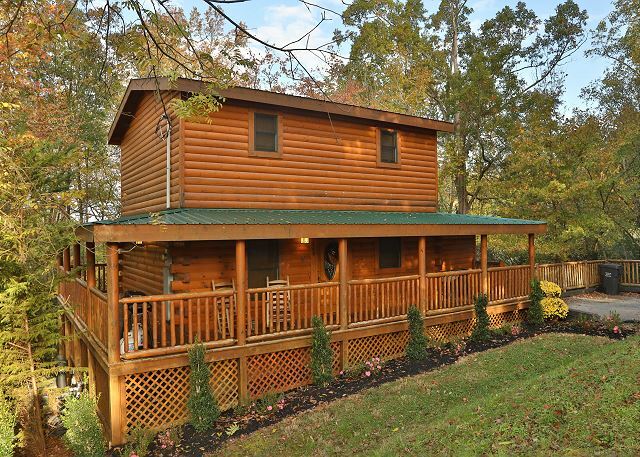 This beautiful, amazing log cabin rental is just 2 miles from Dollywood and walking distance to Dixie Stampede. Kids & adults alike can walk less than 1 mile to the trolley stop, so you would not need transportation from your cabin to get around Pigeon Forge! Your family or friends will be pleased with the location & beauty of the surroundings. You can walk downtown to avoid traffic and parking, and you'll love the game room and wooded setting just 500 feet from the Little Pigeon River. FREE Wi-Fi internet access is convenient for your laptops, smartphones, or Ipads. Relax and read a book or sip on your morning coffee in the several rockers available on your wraparound porch. Enjoy your NEW 47" Flat screen TV with Home Theater Sound Bar/Subwoofer System in living room. Perfect for the Big Game or a Great Movie! This Private Pool cabin is usually a 3 night minimum. For shorter stays, please contact the office at. Book Skinny Dippin' today for the perfect family vacation in the Smokies! Rate is based on 4 adults, each additional adult is $12.50 per night. No smoking is allowed at this cabin. 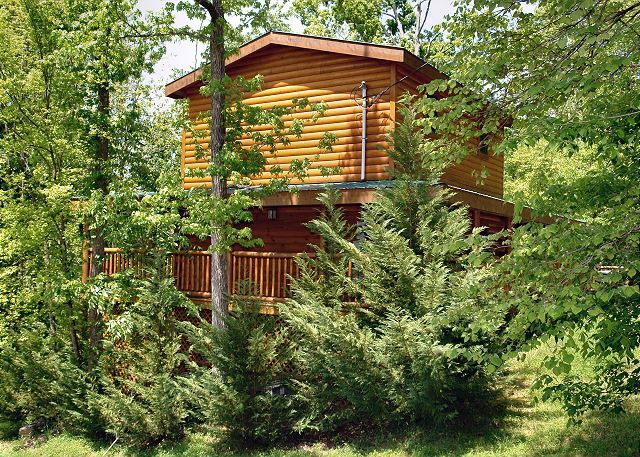 Enjoy golf a short distance from this cabin as well! Reserve this fabulous pool cabin for kids and adults, alike! Skinny Dippin has private pool, hot tub, and wraparound porch with seasonal fireplace! Reserve today! What an amazing family had a wonderful time in pigeon forge....the cabin was absolutely perfect and the people at Aunt Bugs were amazing and so sweet!!!!! We are definitely going back next year!!!! We found our most perfect and favorite vacation spot!!! Everything was perfect. The cabin was everything we expected and more. Our daughter loved the pool and never wanted to leave the cabin. Overall the cabin was beautiful and had plenty to entertain the kids. We wished there was a broom. The washer and dryer were nice, but the dryer took 2 cycles to dry a 1/2 load of clothes. The pool area needs to be swept because we would get little rocks on our feet when we walked to the pool. Other than that, we loved our stay and we didn't want to leave. I have already recommended this cabin to several people and we would not hesitate to rent again in the future! Very nice cabin ... quiet and lovely. Had problems with the internet but the rental company went above and beyond to help resolve the issue. Skinny Dippin is a great place to stay great location and near to most everything. We enjoyed going threw the many shops not only Pigeon Forge but near by towns. And we got some great pictures while driving threw the mountains. One day we all went ATV riding on an Argo 8 wheel drive in the mountains, where you can also go zip-lining this was in Sevierville, TN. I would recommend this cabin if you want to be close to everything and still feel like your not. Beautiful place and lots to do. Cabin was very clean. We enjoyed every second of it. We've been vacationing in Pigeon Forge for 18 years and this was by far one of the best cabins. The cabin was clean and had everything we could possibly need. Great location...Close to everything! I had a great time with my girlfriend here. Had a great experience at the cabin and loved the location. Away from downtown but close enough to get to attractions when wanted to. Always great with Aunt Bugs !!! We came with three children and they really enjoyed the pool and games. The cabin was close to everything but you could not hear any noise from the strip . We really enjoyed the cabin! My family and I had a great time at this cabin! It was spotless,and well kept. We have two small children and everyone had plenty of room. We really enjoyed the game room and the pool. It was so close and convenient to all activities. Even though the cabin was in town it still felt very private. The only issue we had was that there did not seem to be enough towels for showering and pool use. Also, the pool was not as warm as we would have liked. It was a shock getting in, it really was not that bad but it could have been warmer. The cabin does not have wi-fi. The description of the cabin said Internet access, we could not find it. To be very fair, we did not contact management about these issues, it really was not that big of a deal. I am sure they would have been helpful if we called. We will definitely be coming back to this cabin! We loved our cabin, staying here definitely contributed to our wonderful vacation. We look forward to staying at Aunt Bugs next year. The location of the cabin was awsome, just a few minutes from the pigeon Forge Parkway. The cabin was clean and enviting. The only problem we had was with the ants, you couldn't sit nothing on the counters or put stuff in the cabnets (food that is). Guess you could call this little nit pick things but the grass needed cut, and the pool area was terrible.The pebble floor is falling apart and the pebbles where everywhere. The floor really could have used a sweeping.The pool water was cold, there was no way it was 83 degrees.Besides those things the cabin was nice.Would I stay at that cabin again proble not. And thats because I am a nit picker and there was some other little things I thought that could have been done, especially for what the cabin cost.But thats my apinion.I have stayed at other Aunt Bugs cabins and was very satisfied. Very pretty cabin and it is right outside of town! Pool and hot tub were great! Fantastic experience. Very nice and updated cabin. Clean, great pool and amenities. Staff was courteous and helpful. Would definitely stay at an Aunt Bugs property in the future. The cabin Sknny Dippin was wonderful. It was decorated for Christmas. The hot tub was great and the indoor pool was amazing. A great way to spend the week of Christmas for the LaRue family, a nice time was had by all. We had a great time here..our visit was exceptional. The cabin was awesome. The only complaint I can make is that there was too much chlorine in the pool. It was extremely too much. The pool temperature was not as warm as it was supposed to be. The location was superb. Everything was perfect. It felt like home the second we walked in. It was very clean and braiding decorated. The pool was so much fun. Prefect for a family, or a nice private vacation for a couple. I would recommend to anyone. We had a wonderful time. The cabin was everything we had hoped for. Had A lovely stay. Beautiful, clean cabin. The kids loved the pool and hot tub!! Would recommend to friends, and would stay again. my experience with the cabin rental from aunt bugs was great, cabin was well prepared and all amenities were as stated in description, staff was very professional and helpful making check in and check out, the cabin shinny dippin was a great cabin to kick back and relax and was private yet close enough to the parkway that you are only minutes away.